NORTH EAST, Md. – One of the most challenging questions for a high school senior is: what are you going to do with the rest of your life? That was the case for 2011 North East High School graduate Erin Olson. At an early age, Olson’s parents purchased her a small point-and-shoot camera. She fell in love with taking photographs of pets, flowers, stuffed animals, and so much more. In high school, she and her classmates had an opportunity to explore the photography labs at Cecil College during a campus tour. In the meantime, she was also tooling around with graphic design software and felt that was the path for her. “I was in the program at Cecil College for about a year and a half when I decided to change my major. You can have as much passion for something like graphic design and photography, but you also have to have a lot of talent, and I didn’t feel I was there,” said Olson. During her second year at Cecil, Olson took part in a teaching assistant placement in an art class, and she was hooked. 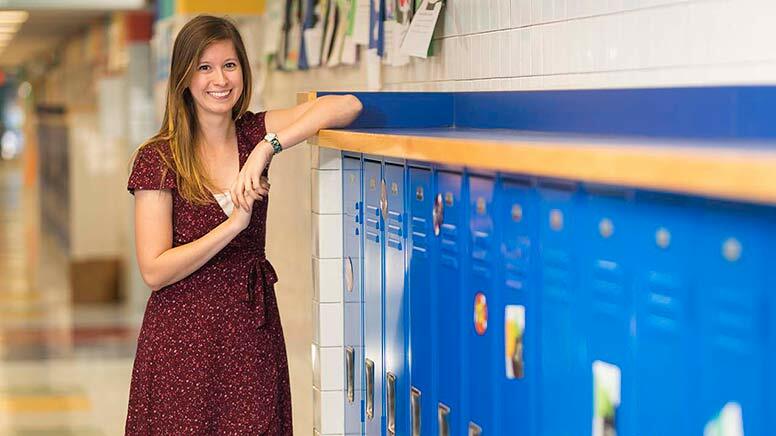 Upon switching to the early education program, she performed a second class placement in an elementary school, and she knew this was her pathway to success. “When I switched to the education program, I met Professor (Jennifer) Greenfield, and she was amazing. I took every class she taught because she was incredible and the way she taught was so real and applicable,” said Olson, who graduated from Cecil College in 2014 with an Associate of Arts in Early Education. Olson went on to attend Towson University’s satellite campus in Bel Air, where she earned a Bachelor of Arts degree in Elementary and Early Education. Attending the Bel Air campus afforded Olson the opportunity to live at home, saving her thousands of dollars. She also benefited from the support of her family and avoided campus distractions so she could focus on work and her education. Olson teaches fifth-grade mathematics, science and social studies at North East Elementary School and finds her students energizing to be around. “I go into work, and I have fun all day long. It is exciting to see kids still excited about learning about things like space travel. I live for the ah-ha moments when we are working on something, and then it clicks, and they are like, ‘OH wow. It makes sense,’” said Olson. Moving forward, Olson is considering pursuing a Master’s degree and become more involved in other school-related programs. “For me, I was able to figure myself out because of Cecil College. It is hard at 17 years old to figure out what you want to do for the rest of your life. Going to a community college, you can explore all these different degree fields and are able to figure out what you want to do before spending thousands and thousands of dollars at a four-year college,” said Olson.